Sticking to a low-carb diet when dining out can be hard, especially at fast-food restaurants. That’s because these meals are often based on bread, tortillas and other high-carb items. Fortunately, most fast-food restaurants offer some good low-carb options. In addition, a number of items can easily be modified for a low-carb lifestyle. Here are 14 delicious fast foods you can eat while on a low-carb diet. Submarine sandwiches are very high in carbs. A typical sub has at least 50 grams of carbs, most of which come from the bun. Ordering your sub prepared “in a tub” (in a bowl or container), rather than on a bun, can save you more than 40 grams of carbs. Turkey breast and provolone: 8 grams of carbs, 1 of which is fiber. Club supreme: 11 grams of carbs, 2 of which are fiber. Chicken salad: 9 grams of carbs, 3 of which are fiber. California club: 9 grams of carbs, 4 of which are fiber. Complete nutrition information for all the subs on their menu can be found here. Although the term “sub in a tub” originated at Jersey Mike’s, you can order your meal this way from any sub sandwich shop, including Subway. Just request that it be prepared as a salad with olive oil and vinegar for the dressing. Bottom Line: To minimize carbs while keeping protein intake high, order your favorite sub sandwich “in a tub” or as a salad. Fried chicken isn’t a healthy choice. For starters, the chicken absorbs a lot of oil during frying. Heating vegetable oils to high temperatures produces harmful compounds. These may increase the risk of heart disease, cancer and other health problems (1, 2). In addition, fried chicken contains about 8–11 grams of carbs per medium-size piece. 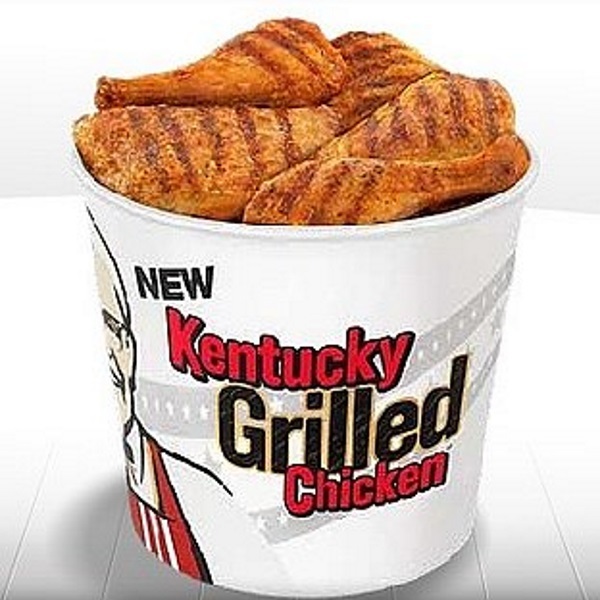 Grilled chicken is a much better option, and is available at many KFC (Kentucky Fried Chicken) places. Each piece of grilled KFC chicken has less than 1 gram of carbs. As for side dishes, green beans contain 2 grams of digestible carbs per serving and are by far the best option. Cole slaw is next, at 10 grams of digestible carbs. Click here for complete nutrition information for all of the chicken options and sides available at KFC. Bottom Line: Choose three pieces of grilled chicken with a side of green beans for a balanced meal that contains less than 10 grams of carbs. Coffee and tea are carb-free beverages. They’re also high in caffeine, which provides some impressive benefits. Caffeine may improve your mood, increase your metabolic rate and boost mental and physical performance (3, 4, 5, 6). Coffee houses and fast-food eateries often have half and half (half milk and half cream) available. Two tablespoons contain only 1 gram of carbs, and a single-serving container has about one tablespoon. Heavy cream is nearly carb-free and is sometimes available. However, it contains about 50 calories per tablespoon, compared to 20 calories for half and half. Some coffee houses also offer soy or almond milk. Unsweetened versions of these milks provide minimal carbs per 2-tablespoon serving. Bottom Line: Order coffee or tea with half and half, heavy cream or unsweetened soy or almond milk at coffee houses and fast-food restaurants. Chipotle is a fast-food Mexican restaurant that has become extremely popular. It’s considered healthier than other chains because it serves organic and naturally raised meat, dairy and produce. Chipotle also makes it very easy to create low-carb meals. A salad with meat or chicken, grilled vegetables and guacamole contains 14 grams of total carbs, 8 of which are fiber. This meal also provides about 30 grams of high-quality protein. A high protein and fiber intake can increase the production of the gut hormones PYY and CCK, which tell your brain you’re full and help prevent overeating (7, 8). And although vinaigrette is available, generous servings of guacamole and salsa make salad dressing unnecessary. Additionally, Chipotle has a helpful online nutrition calculator that allows you to see the exact carb content of your meal. Bottom Line: Select a salad with meat, vegetables, salsa and guacamole for a satisfying meal with 6 grams of digestible carbs. A bun-less burger wrapped in lettuce is a standard low-carb, fast-food meal. It’s high in protein, essentially carb-free and available at all fast-food burger establishments. Cheese: Less than 1 gram of carbs per slice. Bacon: Less than 1 gram of carbs per slice. Mustard: Less than 1 gram of carbs per tablespoon. Mayo: Less than 1 gram of carbs per tablespoon. Onions: 1 gram of digestible carbs per slice. Tomato: Less than 1 gram of digestible carbs per slice. Guacamole: 3 grams of digestible carbs per quarter cup. Bottom Line: Top your bun-less burger with condiments and extra toppings to add flavor while minimizing carb intake. Panera Bread is a café-style fast-food restaurant featuring sandwiches, pastries, soups, salads and coffee. Most of the breakfast items are high in carbs. However, two selections from the Secret Menu of healthy options work well for a low-carb morning meal. The “Power Breakfast Egg Bowl with Steak” features 2 eggs, steak, tomatoes and avocados. It provides 5 grams of carbs and 20 grams of protein. The “Power Breakfast Egg White Bowl with Turkey” contains egg whites, spinach, bell peppers and basil for 7 grams of carbs and 25 grams of protein. Starting the day with a high-protein breakfast promotes feelings of fullness and decreases appetite by reducing levels of the hunger hormone ghrelin (9, 10). Bottom Line: Select an egg-based breakfast with meat and vegetables to keep carb intake low and control hunger levels. Buffalo Wings are delicious and fun to eat. They may also be a low-carb option at pizza places and sports bars, depending on how they’re prepared. Traditionally, Buffalo wings are covered in a spicy red sauce made from vinegar and hot red peppers. An order of these Buffalo wings typically has 0–3 grams of carbs per serving. By contrast, other sauces can add a significant amount of carbs, especially sweet types such as barbecue, teriyaki and anything made from honey. Sometimes the wings are breaded or battered and fried, which is especially common for boneless wings. Therefore, be sure to ask how the wings are prepared and order yours with no breading or batter. Buffalo wings are also usually served with carrots, celery and ranch dressing. Although they’re higher in carbs than many other vegetables, carrots are okay to eat in small amounts. A half-cup of carrot strips contains about 5 grams of net carbs. Bottom Line: Choose non-breaded Buffalo wings with traditional sauce, celery and a few carrot strips to create a meal under 10 grams of net carbs. Sometimes the simplest breakfast option can be the best, such as bacon or sausage and eggs. This traditional breakfast combination is available at most fast-food restaurants and contains a minimal amount of carbs. What’s more, eggs can help keep you full and satisfied for hours (11, 12). In one study of overweight young women, eating sausage and eggs for breakfast helped reduce appetite. It also lowered blood sugar and insulin while reducing calorie intake at lunch, compared to a low-protein, higher-carb breakfast (13). Bottom Line: Choose bacon or sausage with eggs for a breakfast that provides very few carbs, reduces hunger and helps you feel full for hours. Arby’s is one of the largest fast-food sandwich chains in the US. Although the “Roast Beef Classic” sandwich is its original and most popular item, Arby’s has many other options, including brisket, steak, ham, chicken and turkey. Any of these can be ordered without the bread for a tasty low-carb, high-protein meal. The company website provides a nutrition calculator similar to Chipotle’s, so you can customize your order to keep carbs within your target range. For example, you can select Smokehouse Brisket with Gouda cheese, sauce and a side salad for 5 grams of digestible carbs and 32 grams of protein. Bottom Line: Use Arby’s nutrition calculator to construct a high-protein meal within your target carb range. Fast-food Italian restaurants are best known for high-carb foods like pizza, pasta and subs. Fortunately, antipasto salad offers a delicious, low-carb alternative. This salad is traditionally served as an appetizer consisting of assorted meats, cheese, olives and vegetables topped with an olive-oil-based dressing. However, it can be ordered in a larger portion size as an entree. An entree-size serving of antipasto salad is rich in protein and contains less than 10 grams of digestible carbs. Bottom Line: Choose antipasto salad for a filling low-carb meal at an Italian fast-food restaurant. Subway is the most popular fast-food sandwich shop worldwide. In recent years, the chain has been offering chopped salads that can be customized with protein and vegetables of your choice. One of the most satisfying and nutritious options is the “Double Chicken Chopped Salad with Avocado.” It contains 10 grams of total carbs, 4 of which are fiber. It also provides a whopping 36 grams of protein. Avocados are rich in heart-healthy monounsaturated fat and fiber. Eating them at lunch may even lead to lower calorie intake at your next meal (14, 15). A list of the salads available at Subway, along with complete nutrition information, can be found here. Bottom Line: Order a salad with double meat, vegetables and avocados for a delicious and satisfying Subway meal. Many people regard burritos as a favorite food. Burritos typically contain meat, vegetables, rice and beans wrapped in a large flour tortilla. This results in a meal that can easily contain more than 100 grams of carbs. However, almost every Mexican restaurant will allow you to create a low-carb version by leaving out the tortilla and other high-carb items. This is known as a burrito bowl or “bare” burrito. A burrito bowl made with meat, grilled onions, bell peppers and salsa is a delicious and satisfying meal that provides less than 10 grams of digestible carbs. Bottom Line: Choose a burrito bowl or “bare” burrito for the great flavor of a traditional burrito with very few carbs. McDonald’s is the most popular fast-food chain in the world, with more than 35,000 restaurants worldwide as of 2015. Although it’s best known for burgers like the Big Mac and Quarter Pounder, its Egg McMuffin and Sausage McMuffin breakfast sandwiches are also very popular. These breakfast entrées consist of an English muffin with one egg, a slice of American cheese, and ham or sausage. Each sandwich contains 29 grams of carbs. However, ordering either of these items without the muffin will reduce the carb content to 2 grams or less. It’s also a good idea to order two low-carb sandwiches, as each one will only provide about 12 grams of protein. Bottom Line: Order two Egg or Sausage McMuffins without the bread for a satisfying meal with 4 grams or less of carbs and 24 grams of protein. As stated above, ordering a bun-less Arby’s sandwich is a great low-carb option. Additionally, Arby’s offers a “Roast Turkey Farmhouse Salad” featuring roast turkey, bacon, cheese, mixed greens and tomatoes. It contains just 8 grams of carbs, 2 of which are fiber, along with 22 grams of protein. Just make sure not to confuse it with the “Crispy Chicken Farmhouse Salad,” which contains chicken that’s been breaded and fried. It contains 26 grams of total carbs. Bottom Line: Select Arby’s Roast Turkey Farmhouse Salad for a wonderful combination of flavors and textures with 6 grams of digestible carbs. Even if you only see high-carb items on a menu, a delicious low-carb meal can be created at most fast-food restaurants by making simple substitutions. Although fast food is certainly not as healthy as the food you can prepare at home, it’s good to know what to order in case it’s the only available option.